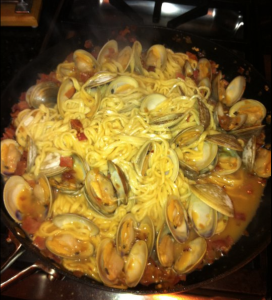 Homemade Pasta with Littleneck Clams – YUM! Louellen's favorite veteran, her Daddy! Over the Memorial Day weekend, I received a visit from my favorite veteran: my father. The visit was a treat, indeed. I had the fun of getting to cook one of our current favorite dishes: homemade pasta with littleneck clams. The recipe for both the pasta and the littleneck clams (we’ve made it with other shellfish as well) is fairly simple. It’s a flavorful dish that will leave guest thinking you slaved for hours in the kitchen. Using the dough attachment on your mixer (I LOVE my KitchenAid), mix together the flour and eggs. Add a tablespoon or two of olive oil and water a tablespoon at a time until dough is the right consistency; forms a ball. Wrap the dough in plastic wrap and let sit for 30 minutes. Unwrap the dough and place on a floured surface. Cut the dough into 4 pieces. Change the pasta press’ setting to 4 and feed each well-floured piece through. Cut the flattened dough into the length you desire. Attach the spaghetti cutter to your blender. Feed each piece of dough through the cutter, separating it as it comes through. Cook in boiling salted water for 6-8 minutes (until it is your preferred texture). Note: if you aren’t going to cook all of the pasta you’ve made right away, you can let dry for a couple of hours and store in a plastic bag for several days. If you’d like to make pasta suitable for drying that has a longer shelf life, replace the eggs with olive oil. My favorite part of this recipe is when the clams finally start to pop open. Duane stumbled upon this recipe while reading Heat: An Amateur’s Adventures as Kitchen Slave, Line Cook, Pasta-Maker, and Apprentice to a Dante-Quoting Butcher in Tuscany by Bill Buford. The recipe was just described without measured ingredients, so what I’m sharing here is our interpretation of the recipe as it’s evolved. Add the red pepper flakes, onions, and garlic. Sauté until the onions are translucent. Add the pancetta and cook for 1-2 minutes. Add the butter, and stir until melted. Add healthy dash of white wine (start with about a half a cup and add to taste) and brig to a boil. Stir in the littleneck clams. Add salted pasta water as needed and cook until all the clams open up (6-8 minutes). Add drained pasta and stir. Put in pasta dishes, top with your favorite cheese, and enjoy! Daddy enjoyed his pasta so much there was nary a bit for poor Liberty! I hope you enjoy this dish as much as we did! It was fun to make this for my dad because he couldn’t recall ever having fresh pasta nor littleneck clams. And at 82, there’s not a lot that he hasn’t tried. He’s a good sport. He has a strong preference for traditional “meat and potato” fare, but will usually give anything a go. He protested while I was making the pasta as he felt it was too much work. He was dubious when I told him we didn’t need to shuck the clams prior to cooking them. And even began to say how stuffed he was from lunch (I admit, I don’t get to cook for my dad often, so he was definitely well-fed throughout the visit!). I could tell that he was prepared to politely not eat his meal. Suggestions for other ways we can enjoy fresh pasta? Or know of a great recipe? Let us know in the comments. Burn the Floor is Smokin’ Hot!